I’ve always had a thing for Irish writers and especially playwrights. Sean O’Casey, Samuel Beckett, Oscar Wilde, George Bernard Shaw, J M Synge — I’ve had amazing evenings in the theater with their work. Several contemporary Irish writers are doing important work too — Conor McPherson (This Lime Tree Bower, The Weir, Seafarer, Dublin Carol, Shining City), Enda Walsh (Penelope, Once), Deirdre Kinahan (Moment), and most of all, Martin McDonagh. McDonagh writes outrageous in-your-face theater such as that often done by Steppenwolf Theatre in Chicago. Pillowman, Beauty Queen of Leenane and Lonesome West are my favorites. The casting is brilliant. Colin Farrell as an alcoholic film writer with writer’s block. Sam Rockwell as his buddy and mastermind of the dognapping business. (I know, I know. Bear with me here.) Christopher Walken is inventive, funny and poignant. Woody Harrelson is a gangster who loves his missing shih-tzu. Tom Waits is a serial killer with a bad hairpiece and a rabbit. And I haven’t listed all the psychopaths yet. Let me say, for you animal lovers, that all the blood and violence is committed on humans. No animals are even touched. Although Bonny, the shih-tzu, comes close. 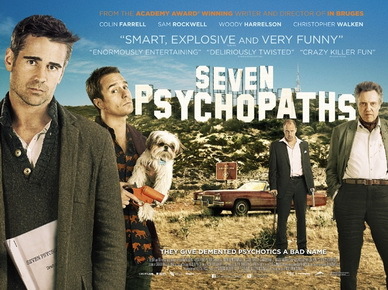 Seven Psychopaths is so good, I will see it again. And again. McDonagh’s earlier film, In Bruges, is equally good, but has a more linear plot structure. I think I want to see it again too.